Brody at the 2002 Cannes Film Festival. Taking acting classes as a child, by age thirteen he appeared in an Off-Broadway play and a PBS television film. After appearing in Bullet in 1996 with Tupac Shakur and Mickey Rourke, Brody hovered on the brink of stardom, receiving an Independent Spirit Award nomination for his role in the 1998 film Restaurant and later praise for his roles in Spike Lee's Summer of Sam and Terrence Malick's The Thin Red Line. He received widespread recognition when he was cast as the lead in Roman Polanski's The Pianist (2002). To prepare for the role, Brody withdrew for months, gave up his apartment and his car, broke up with his then-girlfriend, learned how to play Chopin on the piano, and lost 29 lbs (13 kg). The role won him an Academy Award for Best Actor, making him, at 29, the youngest actor ever to win the award, and to date the only winner under the age of 30. He also won a César Award for his performance. Brody appeared on Saturday Night Live on May 10, 2003, his first TV work, controversially giving an improvised introduction while wearing faux dreadlocks for Jamaican reggae musical guest Sean Paul. Other TV appearances include NBC's The Today Show and on MTV's Punk'd after being tricked by Ashton Kutcher. After The Pianist Brody appeared in four very different films. In Dummy (released in 2003 but originally shot in 2000, just prior to his work in The Pianist) he portrayed Steven Schoichet, a socially awkward aspiring ventriloquist in pursuit of a love interest (his employment counsellor). He learned ventriloquism and puppetry for the role (under the tutelage of actor/ventriloquist Alan Semok) convincingly enough to perform all of the voice stunts and puppet manipulation live on set in real time, with no subsequent post dubbing. He played Noah Percy, a mentally disabled young man, in the film The Village, by M. Night Shyamalan, shell-shocked war veteran Jack Starks in The Jacket, writer Jack Driscoll in the 2005 King Kong remake, and father-to-be Peter Whitman in The Darjeeling Limited by Wes Anderson. King Kong was both a critical and box office success; it grossed $550 million worldwide and is Brody's most successful film to date in monetary terms. Additionally, Brody played a detective in Hollywoodland. He has also appeared in Diet Coke and Schweppes commercials as well as Tori Amos' music video for "A Sorta Fairytale". On January 5, 2006, Brody confirmed speculation that he was interested in playing the role of The Joker in 2008's The Dark Knight. However, Christopher Nolan and Warner Bros. decided instead to cast Heath Ledger in the role. He was also in talks with Paramount to play Spock in J. J. Abrams Star Trek XI, but it ultimately went to Zachary Quinto. In 2010, he starred in Splice, a science fiction film written and directed by Vincenzo Natali. Originally a Sundance film, Splice was adopted by Dark Castle Entertainment and distributed by Warner Bros. Most recently, he played the star role of Royce in Predators (a sequel to the original Predator), directed by Nimród Antal and produced by Robert Rodriguez. In 2011, Brody starred in a Stella Artois beer ad called "Crying Jean" that premiered right after half-time of the Super Bowl XLV as part of Stella's "She Is a Thing of Beauty” campaign. He appeared in Woody Allen's 2011 Academy Award-winning comedy Midnight in Paris as Salvador Dalí. On January 16, 2012, Brody made his debut as a runway model for Prada Men Fall/Winter 2012 show. In 2014, Brody collaborated again with Wes Anderson in the Academy Award-winning The Grand Budapest Hotel, where he played Dmitri. The following year, he starred as Tiberius in the Chinese film Dragon Blade, which grossed $54.8 million in its opening week in China. Brody began dating Spanish actress Elsa Pataky in 2006. For Pataky's 31st birthday in July 2007, Brody purchased her a 19th-century farm in Central New York state that was remodeled to look like a castle. Brody and Pataky were featured at their New York home in a 35-page spread for HELLO! magazine in October 2008. The pair broke up in 2009. In 2010, Brody sued the Giallo filmmakers, alleging that they failed to pay his full salary. ↑ "Adrien Brody Biography (1973–)". Filmreference.com. Retrieved October 24, 2008. ↑ Leslie Camhi (18 March 2005). "An Autobiography in Pictures". The Jewish Daily Forward. New York City: forward.com. Retrieved 2012-02-03. ↑ Meyers, William (27 January 2005). "Rescuing Beauty From History's Dark Corners". The New York Sun. nysun.com. Retrieved 2012-02-03. ↑ Fox, Chloe (12 November 2006). "The prime of Adrien Brody". The Guardian. Manchester: guardian.co.uk. Retrieved 2012-02-03. ↑ Waxman, Sharon (2 January 2003). "A Hunger Artist; Adrien Brody Gained Gravitas by Losing Weight To Play a Holocaust Survivor in 'The Pianist'". The Washington Post. washingtonpost.com. Retrieved 2012-02-03. ↑ Sylvia Plachy (31 December 2002). "My Son the Oscar Contender". The Village Voice. villagevoice.com. Retrieved 2012-02-03. ↑ "About Adrien Brody". Yahoo! Movies. Retrieved September 24, 2012. ↑ "Long Lake Theater Camp". longlakecamp.com. 21 January 2011. Retrieved 2012-02-03. 1 2 Dotson Rader (25 July 2004). 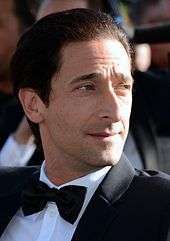 "Adrien Brody: 'I Want To Succeed For The Right Reasons'". Parade. Retrieved 2012-02-03. ↑ "Adrien Brody biography". biography.com. Retrieved November 13, 2013. 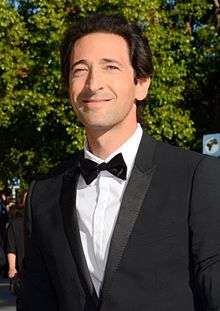 ↑ "Adrien Brody: Biography". TV Guide. Retrieved November 13, 2013. ↑ Jett (7 January 2006). "BOF News Archives 45: Update on Sequel Rumors". Batman-on-film.com. Retrieved October 24, 2008. ↑ Pascale, Anthony (February 26, 2007). "Casting Rumor: Damon, Brody & Sinise for Kirk, Spock & McCoy". Trekmovie.com. Retrieved October 24, 2008. ↑ RutheStein (17 May 2009). "Adrien Brody tries comedy in 'Brothers Bloom'". San Francisco Chronicle. sfgate.com. Retrieved 2012-02-03. ↑ Borys Kit and Jay A. Fernandez (7 October 2009). "Adrien Brody to star in new take on "Predators"". Reuters. Retrieved 2012-02-03. ↑ Goldberg, Matt. "MIDNIGHT IN PARIS Review". collider.com. Retrieved November 13, 2013. ↑ "Adrien Brody: Prada runway model". The Daily Telegraph. Telegraph.co.uk. 13 January 2012. Retrieved 2012-02-03. ↑ Carpenter, Susan (7 November 2007). "Adrien Brody's other passion". Los Angeles Times. LATimes.com. Retrieved 2012-02-03. ↑ "Adrien Brody". South African TV Authority. Retrieved 2012-02-03. ↑ Daily Mail Reporter (2008-10-07). "The 19th century New York castle romantic film star Adrien Brody bought his fairytale princess". Daily Mail. Retrieved 2012-12-28. ↑ Hello (2008-10-07). "Adrien and Spanish love Elsa share their 'dream castle' with HELLO!". Hello magazine. Retrieved 2012-12-28. ↑ Marcy (2009-05-16). "Adrien Brody's Girlfriend leaves him for Olivier Martinez". Zimbio. Retrieved 2012-12-28. ↑ Anthony McCartney (September 24, 2010). "Adrien Brody: Suing 'Giallo' Filmmakers Was My Only Option". huffingtonpost.com. Retrieved 2012-12-18. 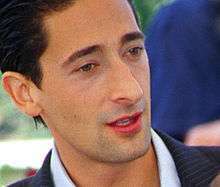 Wikimedia Commons has media related to Adrien Brody.